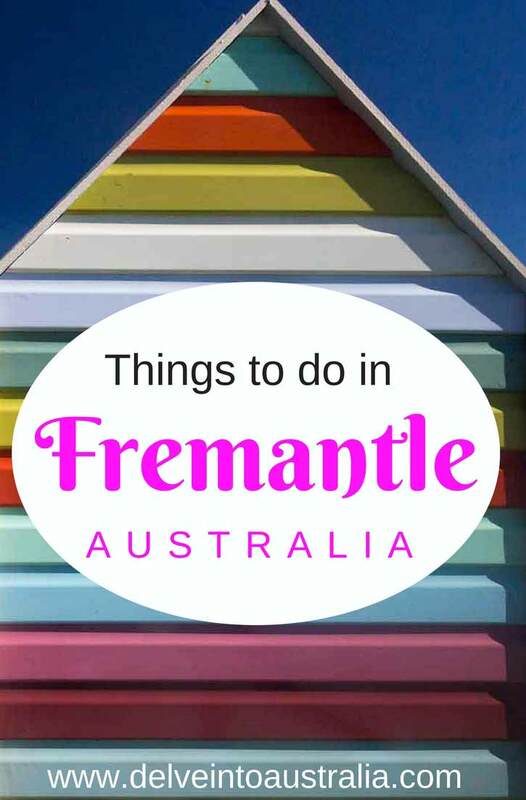 We were blown away by the range of things to do in Fremantle on our recent visit to the port city. We decided to stay in Fremantle while visiting Western Australia for a friend’s wedding across the river in Perth, partly to sample some of the famous Fremantle nightlife. We stayed almost a week and left feeling a strong affinity with this fine port city. 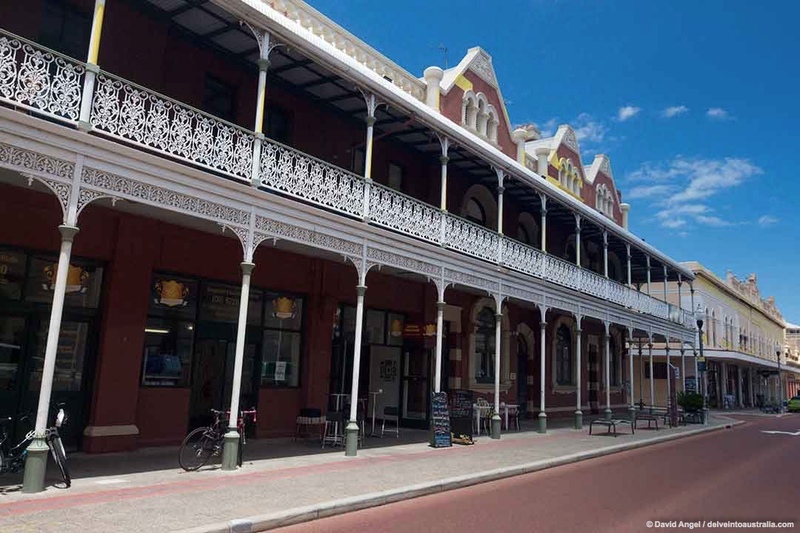 Discovering the city of Fremantle was a wonderful experience, full of surprises. The first was the distinctive cityscape, streets lined with grand 19th century buildings in the unique Australian style with verandahs and ornate wrought-iron parapets. Freo, as it’s known to locals, also seems to have a wonderful free spirit that’s hard to describe or define, but you see it everywhere. 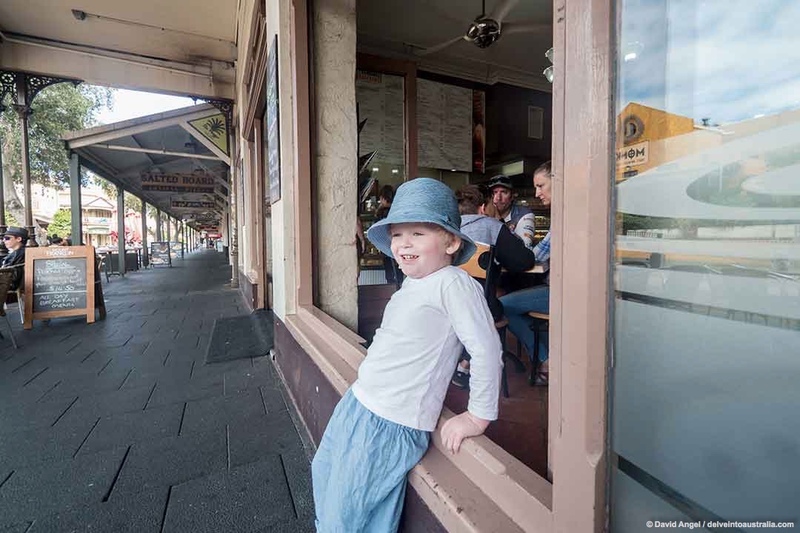 Fremantle has a strong, vibrant arts and music scene, and the city, its many independent shops, cafes and businesses all seem to have picked up on the whole creative vibe, this sea-salt, slightly radical, collective yet individual identity and character pervades everywhere. It is wonderful, and they really should try to bottle it. 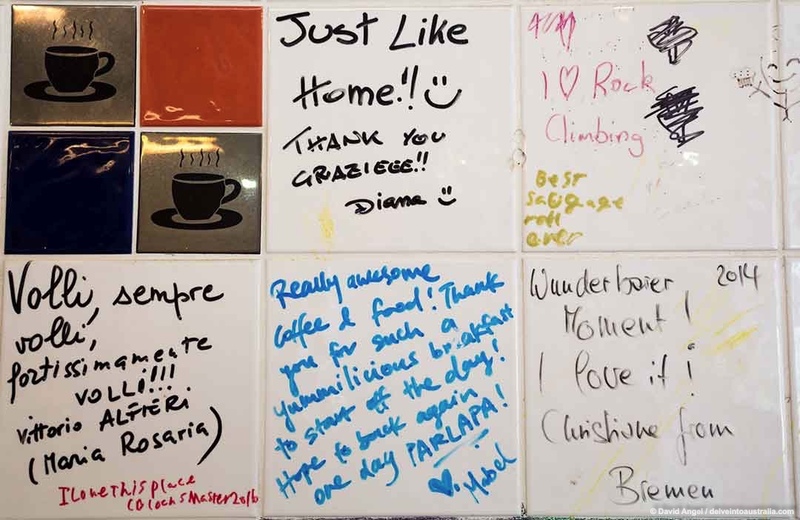 Like many ports around the world, Fremantle is a melting-pot of different cultures. In some ways it reminds me of some of the great ports I’ve visited in Europe, including the likes of Hamburg in Germany, Cadiz in southern Spain, Marseille in France and Liverpool in England. It may have a shorter history than these, but has a similar maritime multicultural feel, and buckets of soul. This is our guide to the best things to do in Fremantle. The Round House is the oldest building in Western Australia, built in 1831 as Fremantle’s original prison, tiny in comparison with its successor. The Heritage guides we met were wonderful, keen to show us around the rooms inside and the views outside, including the brilliant Arcs et ellipses work by Felice Varini, a series of bright yellow ellipses painted on buildings the length of High Street, including the Town Hall Tower, which was commissioned for the 2017 Fremantle Festival. 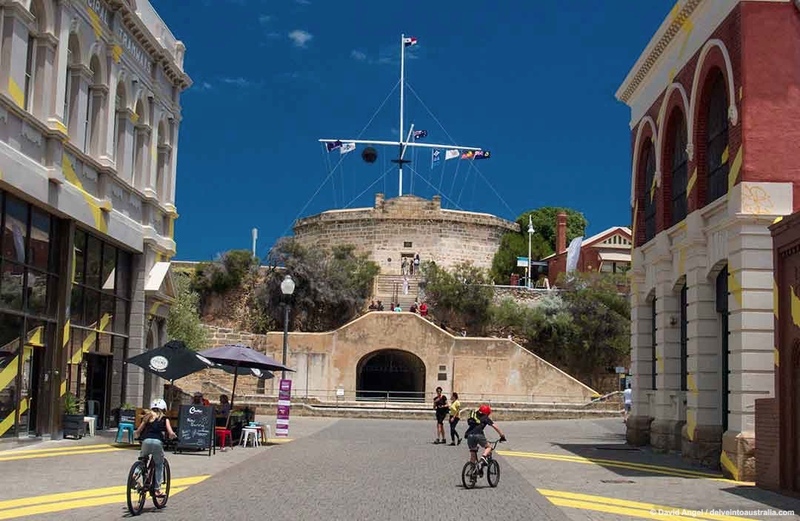 It’s a great starting point for a visit to Fremantle as it’s one of the best viewpoints in the city, with great views along the coast and of the historic streetscape of this 19th century port. 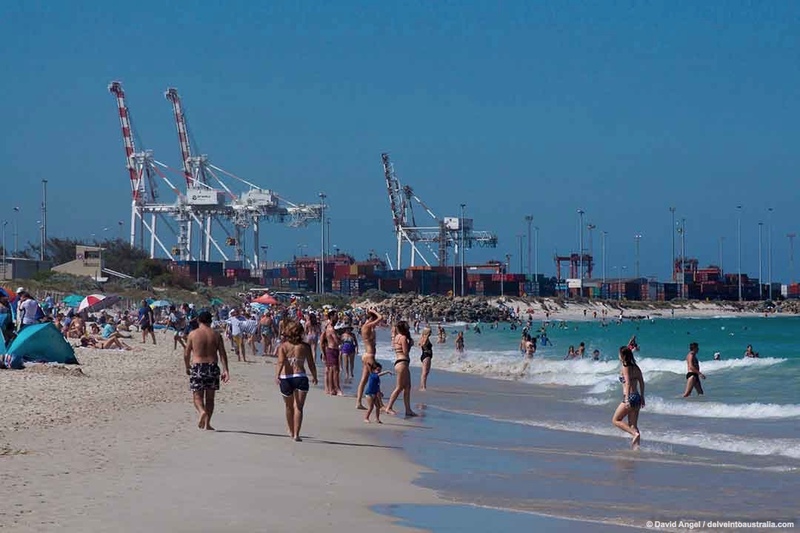 Bathers Beach is the closest beach to the centre of Fremantle, between the Fishing Boat Harbour and the Round House. 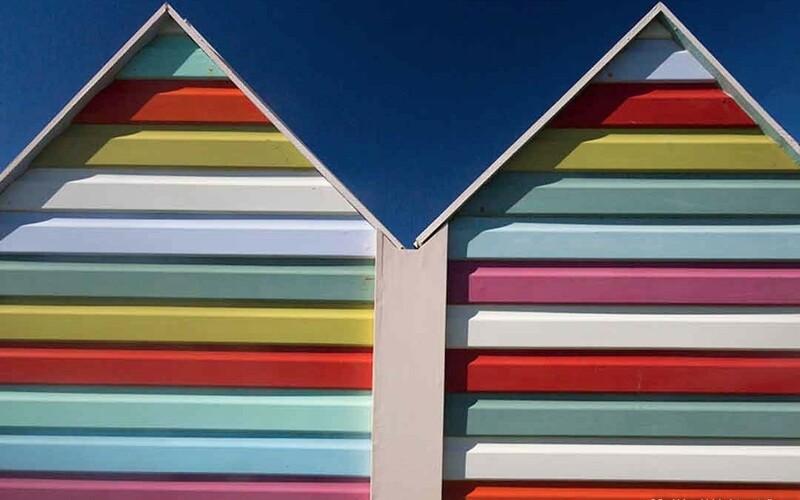 It’s two gorgeous curves of white sand washed by the turquoise waves of the Indian Ocean, and because of its location it’s the most developed of the Fremantle beaches, with restaurants such as the Bathers Beach House and Cicerello’s right next to it. 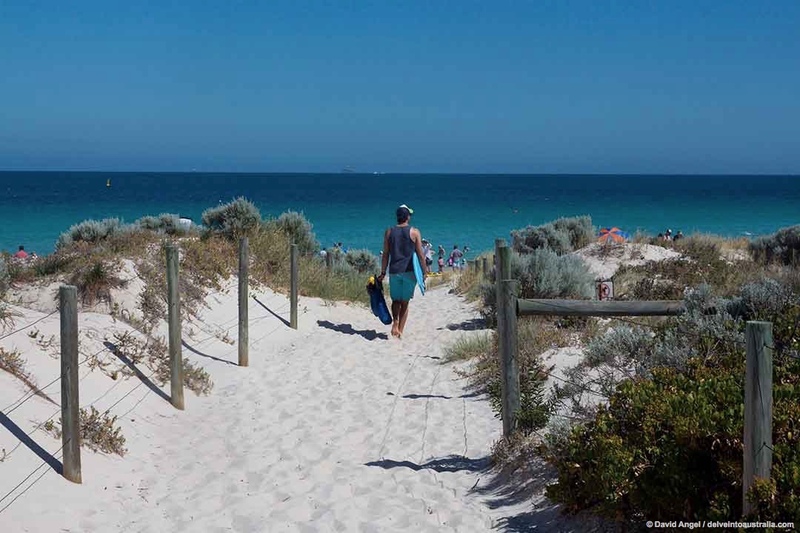 Another of our favourites is Port Beach, up in North Fremantle, with more of the same sand and beautiful ocean combination, hugely popular with locals who had packed the beach before the heat of the day at 8.30 on a Sunday morning. The cranes of the nearby port loom in the background, adding even more character to the scene. Leighton Beach is the northern continuation of Port Beach, which was also packed when I was there, this time with a surf lifesaving carnival with a great atmosphere. 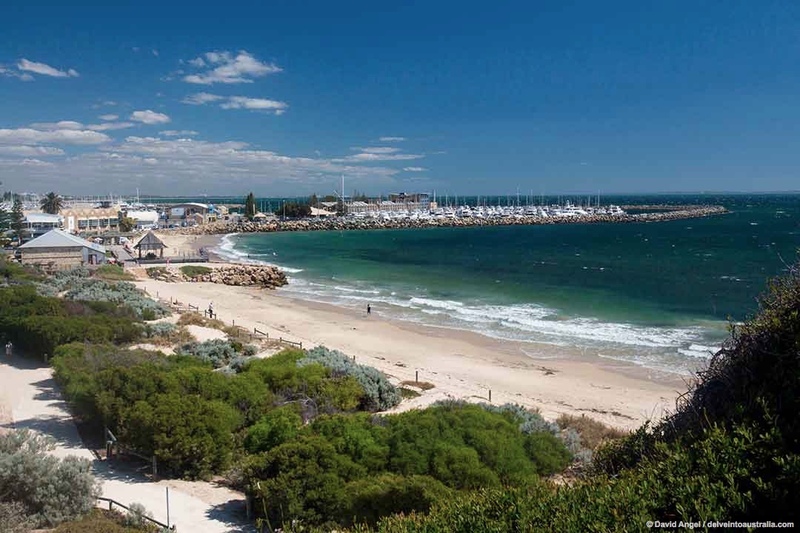 South Fremantle beach is on the free blue CAT bus route that runs down from the Cappuccino Strip on South Terrace, and deserves the same superlatives I’ve given to the other Fremantle beaches. 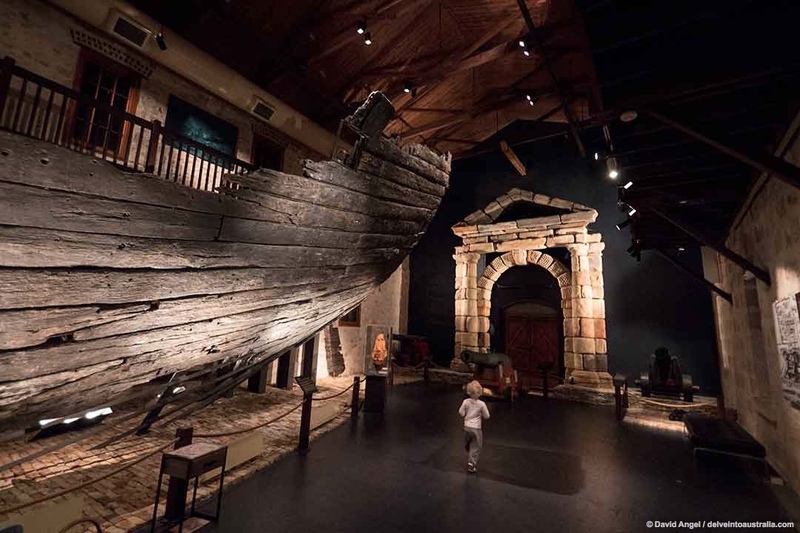 The Shipwreck Museum – the WA Museum Shipwreck Galleries is its full official name – is one of the best museums we’ve visited in Australia. 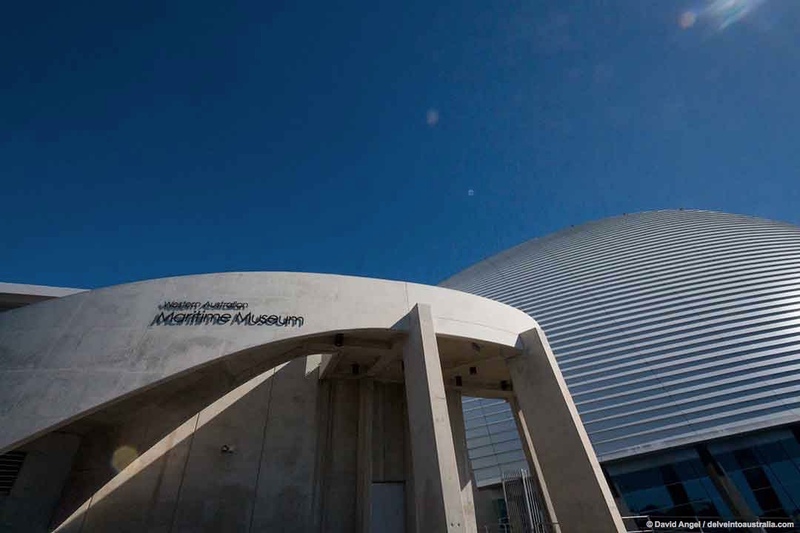 You really need to visit it in conjunction with the WA Maritime Museum in the port area. The Shipwreck Museum is located next to Bathers Beach, a short walk down from the Round House and next to Esplanade Park. Having lived on the east coast of Australia for two years or so, the exploration of the west coast of the continent by Dutch explorers doesn’t get much mention in comparison with the British landings and colonisation, and the same goes for what we were taught in British schools back in the day. This Museum gives a much more balanced view. The north and north-west of Australia had been discovered 50,000 years or more before by those who became the first Australians, with regular routes from what are now the islands of Indonesia. The Dutch East India Company took over this part of the world, and some of their ships – both unintentionally and intentionally – landed on northern and western Australian shores over the course of the 17th century, eventually naming it New Holland. The Dutch had also mapped the western half of the continent long before Captain Cook made landfall in 1770. Our little man was captivated from the moment we walked in. Straight away he was looking at items salvaged from various wrecks along the western Australian coast. For him this was one big treasure hunt, and he was completely engrossed in it. The skeleton of one wreck victim required some explanation, though he didn’t take long to return to his treasure quest. The highlight for him was the wreck of the Batavia, a Dutch ship wrecked in the Houtman Abrolhos Islands off the west coast in 1629. A large part of the wooden frame of the ship remains, along with a replica of a stone portico that was carried on board. It’s a very moving museum, absolutely fascinating. 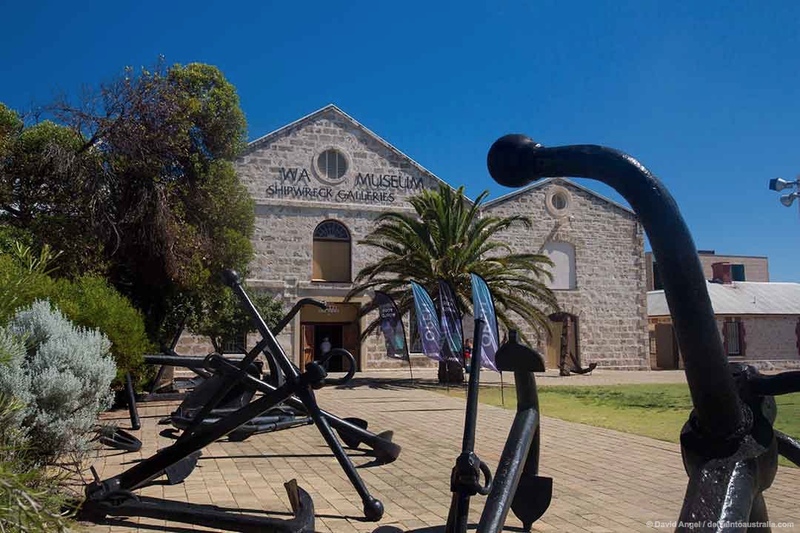 The Western Australian Maritime Museum is a ten-minute walk or a short bus ride from the Shipwreck Museum, in an impressive purpose-built modern building where the Swan River meets the Indian Ocean. 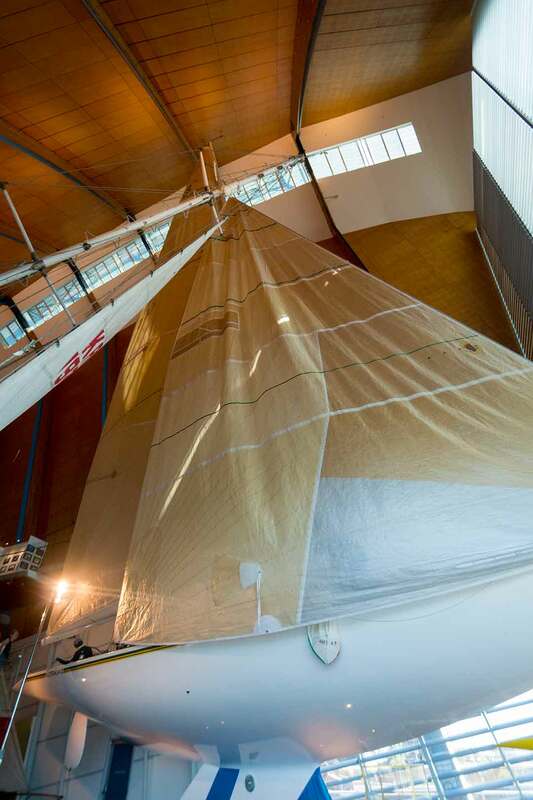 The Maritime Museum was built high to accommodate some of the permanent exhibits, including the yacht Australia II which captured the America’s Cup, the world’s oldest international sports trophy, in 1983. I had the pleasure of the company of the little fellow for the day, and sold him the idea of the visit to the museum on the back of the Pompeii exhibition which was on at the time. He is a great lover of volcanoes, but breezed through the entire exhibition in about two and a half minutes. However, he was greatly impressed by the scale and height of the building, and kept eagerly running ahead to see as many of the boats as possible. He also loved the old Swan River ferry that ran back and forth to Perth, and the huge missile in the Naval Defence section. I was most intrigued by the Indian Ocean Gallery, including the atmospheric ship interior, and the Cargoes Gallery. There’s also a submarine – HMAS Ovens – berthed outside, and you can also explore this as part of your visit. 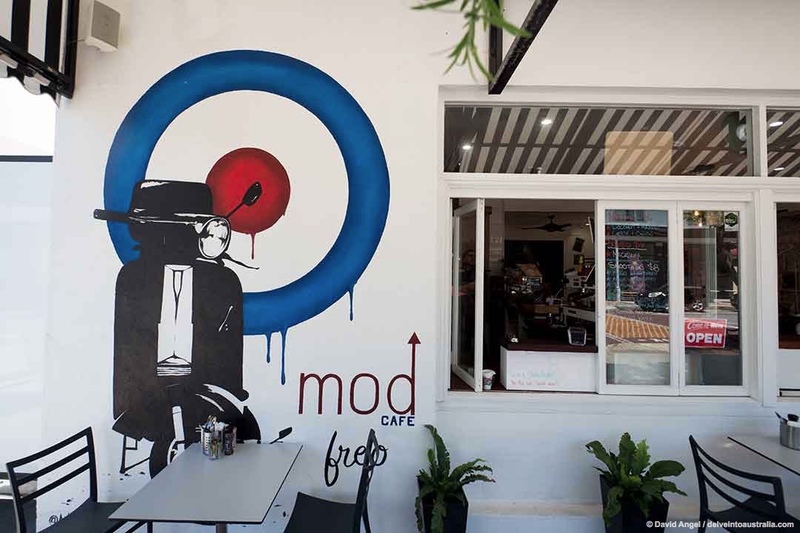 Fremantle has so many great cafes, bars and restaurants, with the biggest concentration along the famous Fremantle Cappuccino Strip, which is on South Terrace. We made sure we sampled as many places as we could along the Strip, all in the name of thorough research, and loved the cakes and coffee at Fremantle Bakehouse and the risotto at Gino’s, made with some of the freshest ingredients you could ever hope to taste, transporting us back to our beloved Italy for half an hour or so. 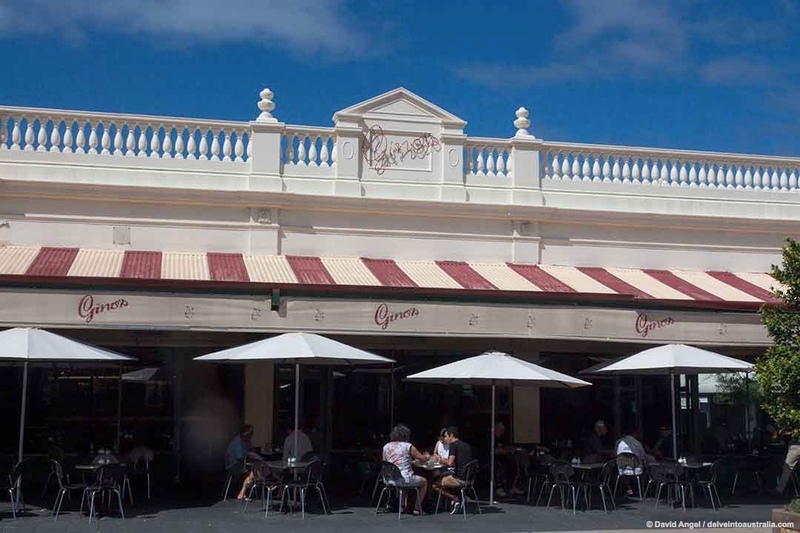 One of the best things about Fremantle is the sheer variety of cuisines and cultures you find around the city, and we also tried some great Vietnamese food there. 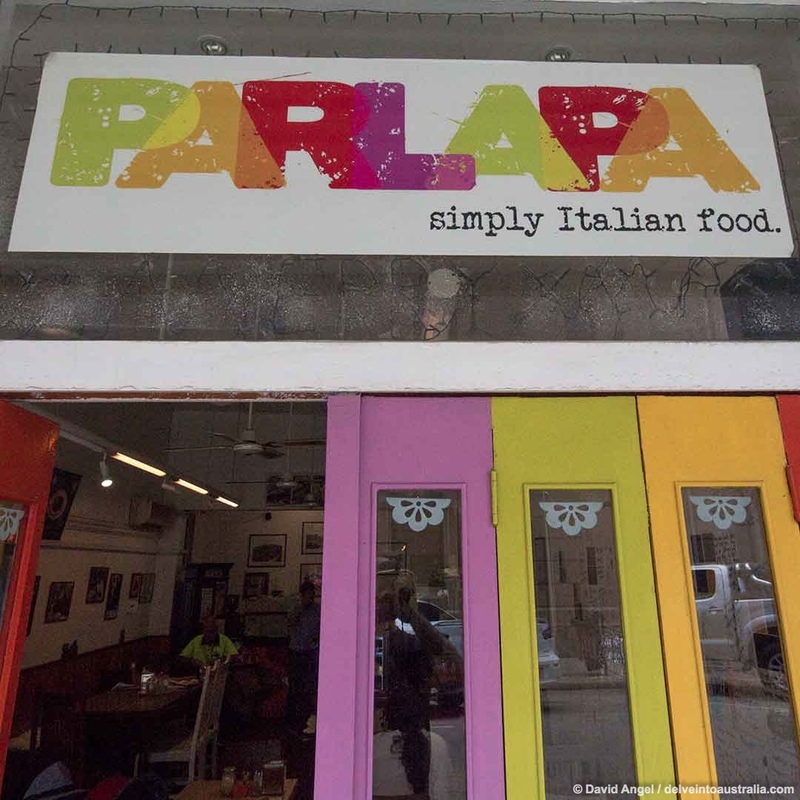 We also loved Parlapa, a gorgeous quirky Italian place near the Town Hall run by a lovely lady from Turin. Between the three of us we went through all the courses on the menu, and all were impeccable. The Cappuccino Strip is at its liveliest on a balmy summer’s evening, when everyone is sitting at outside tables dining or drinking al fresco. 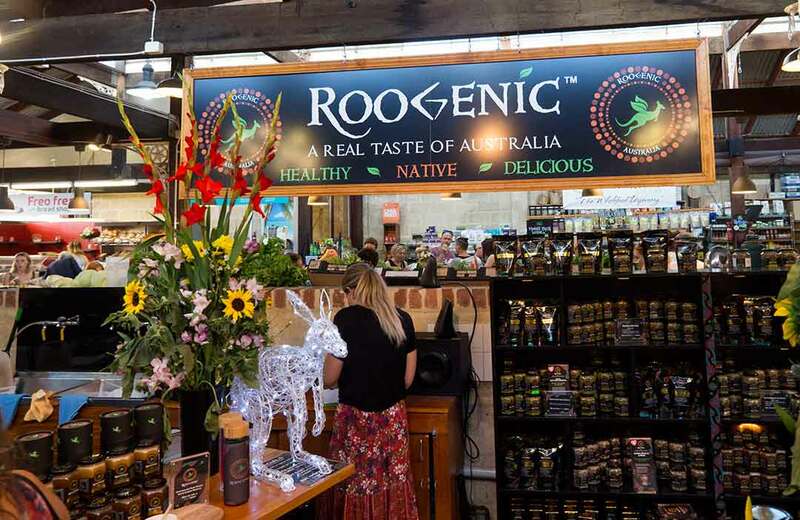 Fremantle Markets are one of the port city’s biggest attractions for visitors, and the whole place was buzzing in the couple of hours or so that we spent there. Most of the 150 or so stalls are in the covered market area on South Terrace, close to the Cappuccino Strip. Wherever we go, we always seek out the local markets, and Fremantle’s are great. There’s all the fresh seafood and produce and great regional health foods for the locals and Perthites, and a lot of street food stalls and tiny restaurants on the street side. There’s also a whole range of stalls selling books, art and design. One of our favourites was the Stunned Emu Designs stall, by local author and graphic artist Wendy Binks – our little man had received one of her books for Christmas a few weeks before our visit. 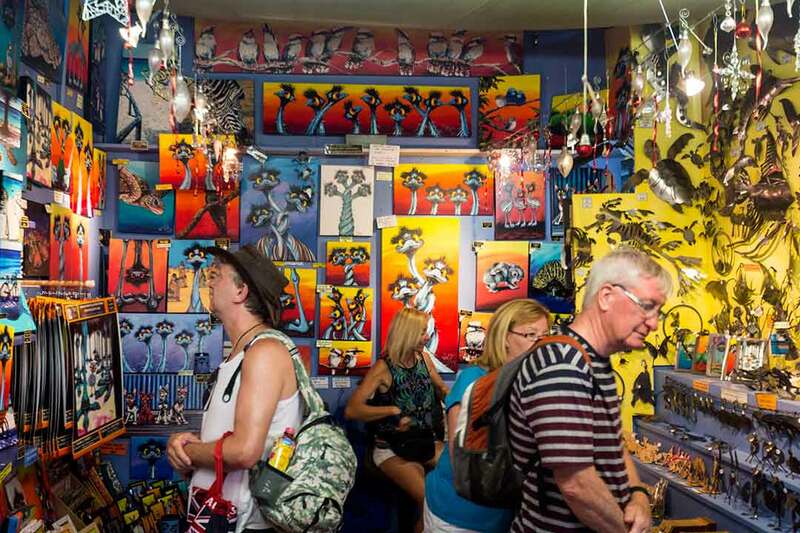 Fremantle Markets are the best possible place in the region to show and see work like this, and for us the Markets fit in very much with the ethos of the rest of the city, with a proud, individual, independent spirit with an eye for the quirky and an ear for wit. The Markets are open on Fridays, Saturdays, Sundays and Holiday Mondays. 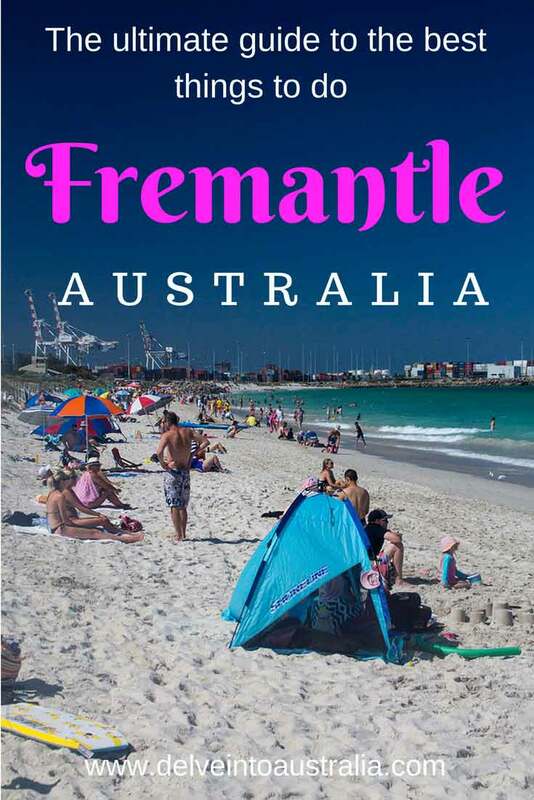 Unlike the first cities and towns to be founded in New South Wales, Fremantle was founded as a free settlement. It was only later, in 1849, that the British colonists decided to turn the Swan River settlement into a penal one – all with the avowed aim of boosting the local economy. Upon arrival, the first thing the convicts had to do was build the vast prison that would house them. 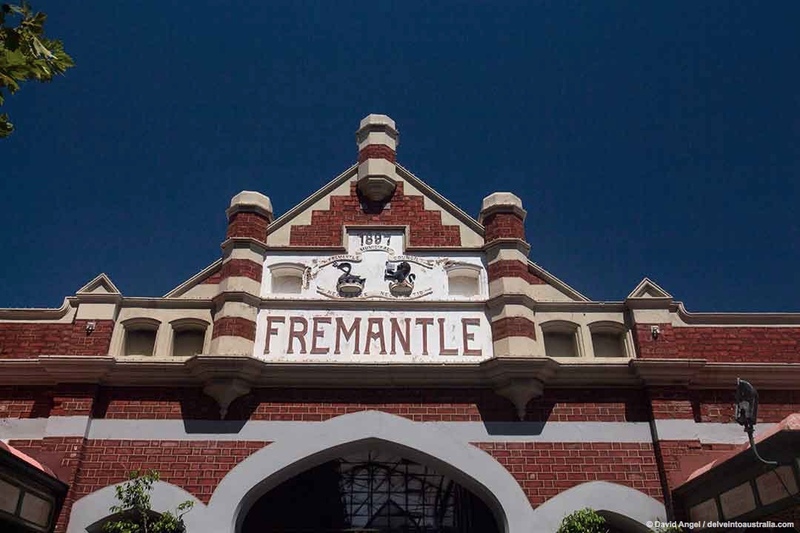 It was completed by the late 1850s, and housed over 10,000 convicts transported from Britain – the last transport was in 1868, and Fremantle Prison became the region’s main prison in 1886, when very few of the convicts remained in custody. It remained in use as a maximum security prison for over a century, finally being decommissioned in 1991. 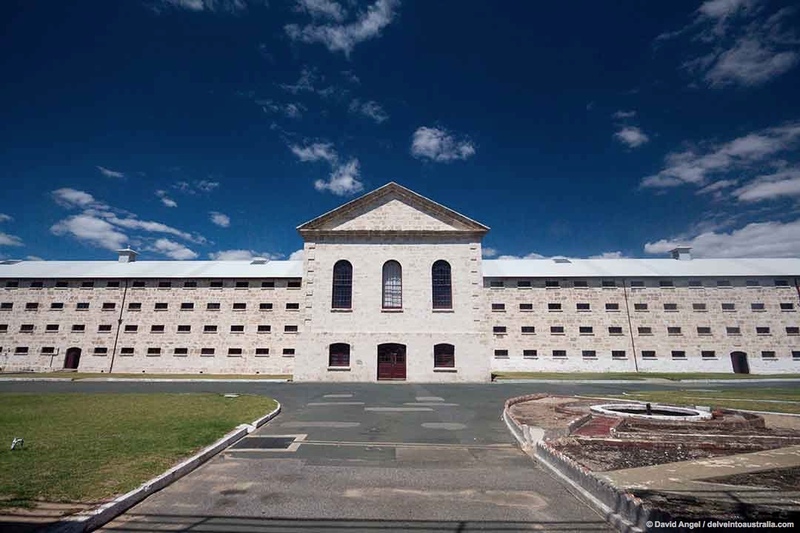 Fremantle Prison is one of eleven Convict Sites across Australia to be awarded UNESCO World Heritage status, and it’s the only building in Western Australia to be accorded such status. The Prison runs several different themed guided tours, including one on the Convict Era, when you hear some of the stories of those transported from Britain, many for minor crimes. Another tour – Behind Bars – focuses on its later history as a maximum security jail, and there is also a Tunnel Tour, exploring the network of escape tunnels dug by inmates. Fremantle Arts Centre looks fascinating. They seem to have an excellently curated programme of events, the sort of place we’d visit every week if we lived in the area. However, time wasn’t on our side during this trip, and we weren’t able to visit for very long. 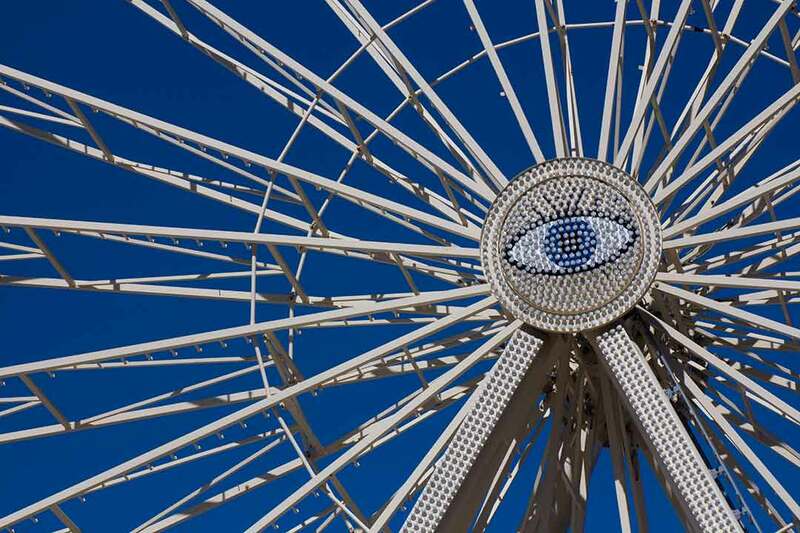 Esplanade Park is the biggest park near the centre of Fremantle, with a great children’s playground and café, all just a short walk from Bathers Beach, the Shipwreck Museum, and Fishing Boat Harbour. It’s also home to a lovely ferris wheel, which unfortunately was closed for maintenance during our visit. 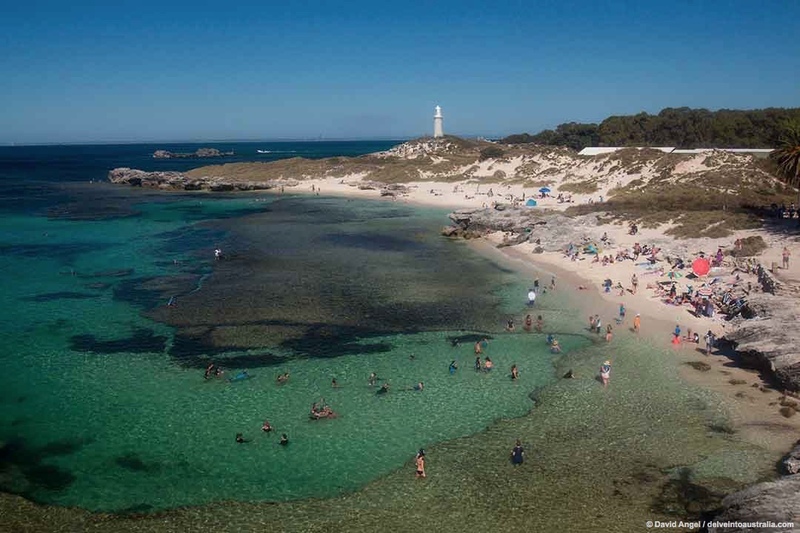 Rottnest Island is a mini-paradise 19 km off the coast, and one of the most popular things to do in Fremantle is to take the ferry across for a day trip. It’s also the weekend break destination of choice for the good denizens of Perth, and popular for longer stays. We took the Sealink ferry across from Fremantle and had five or six hours on the island, and what we saw made us yearn to come back for much more. There are no cars on Rottnest – you either bus it, bike it or walk it. We opted to head for the Basin, one of those world bucket list beaches a short walk from the ferry wharf and the main settlement, Thomson Bay, and also explored Pinky Bay beach, which is overlooked by the Bathurst lighthouse. The Basin beach is one of the most memorable beaches we’ve visited anywhere. The aquamarine water was some of the clearest we have ever swum in, and the reefs and pools offshore make for great snorkelling. We also spent time there meeting the local wildlife in the shape of the curious and cute quokkas. They have been compared to both cats and rats, but are small marsupials, probably resembling smaller wallabies most of all. They happily hop and scuttle around you and are experts at ferreting their way into picnic bags and baskets. Our little man absolutely adored them. We only explored the north-east corner of the island, but there are many more beaches, with plenty of swimming and snorkelling along the way, and so much marine wildlife to see.